Latvia - Challenged with lighting a huge concert featuring 20,000 performers celebrating Latvian culture in an open air space, lighting designer Normunds B?as?ns felt he could only achieve his vision by specifying Philips Vari-Lite's high-output VL3015LT Spots, VL3500 and VL3000 Washes. 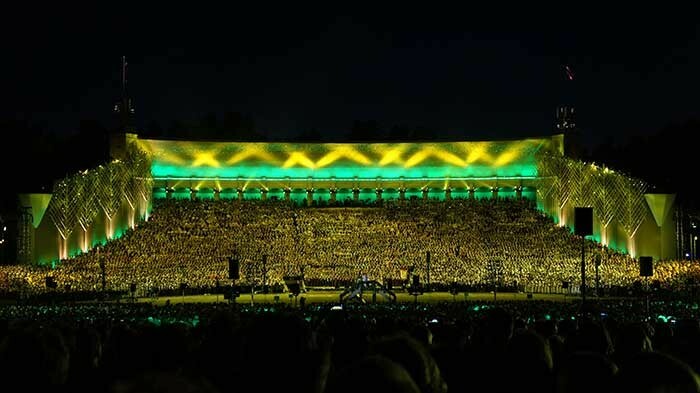 Local rental house and production company NA Stage & Light supplied 20 VL3015LT Spot luminaires, 16 VL3000 Washes, and 24 VL3500 Wash fixtures for the massive 25th Latvian Song and Dance Festival, which drew an audience of more than 40,000. 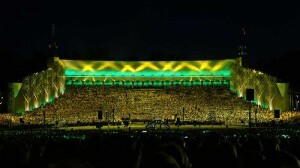 The event celebrates Latvian music, dance, art, and culture and took place in the capital Riga's Song Festival at the Open Air Stage - Mezaparks. "Our job was to light up the open air stage, which had more than 20,000 singers and dancers taking part - a huge space," says NA Stage & Light's Ritvars Sakals. "16 VL3015LT Spots were rigged at the rear of the stage to bring dramatic backlight to centre stage, highlight some specific performance areas and give colour and texture to the background. We also had a further four rigged side of stage for cross and key light. The VL3000s were all used to wash the back of the stage and the VL3500s rigged at the sides to wash the central areas. We knew with a stage this big that only these Vari-Lites could provide the output and effects that we needed." 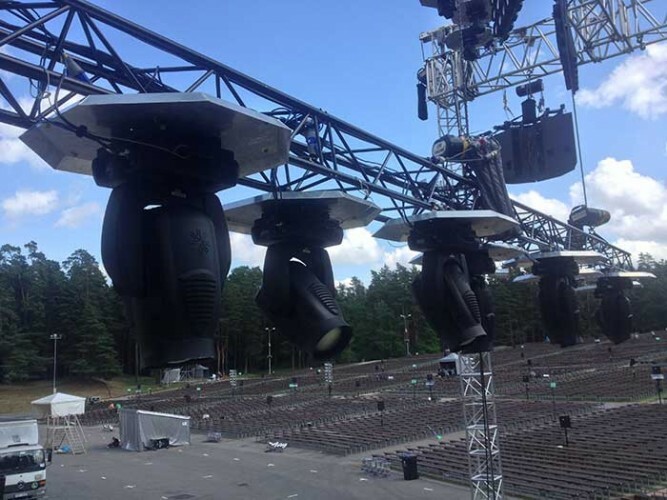 Lighting designer and co-founder of NA Stage & Light, B?as?ns continues: "I've been using Vari-Lite for more than fifteen years, and for me there are no other fixtures that can compete in the entertainment market. The light output, colour, and optics are incredible - I use them whenever I can!" Philips Entertainment's Martin Palmer adds: "The VL3015LT features a zoom range of 6° to 60° allowing for use in a multitude of applications from stadiums to theatres. This made them a fantastic solution for major events in large spaces, and perfect for the Riga Song Festival at the huge open air stage in Mezaparks. "The VL3015LT utilises a 1500W double-ended short arc lamp which offers an unprecedented output. Featuring 10:1 zoom optics, CYM colour mixing, variable CTO wheel, two five-position colour wheels, three gobo/effects wheels, a beam size iris, and separate dimmer and ultra-fast strobe mechanisms which makes it an excellent all round workhorse and effects luminaire." Additionally, the luminaire contains an independent rotating and indexing three-facet prism as well as an independent frost glass. The VL3000 and VL3500 Washes are also incredibly bright, with both luminaires featuring superior colour and beam control. Additionally, the versatile VL3500 Wash offers the Vari*Brite mode, which can be engaged to offer a tight column of remarkably intense light. The week-long Latvian Song and Dance Festival - which happens every five years - brings together local choirs and folk artists to explore and present the richness and diversity of Latvian culture. The Song and Dance Festival has become a kind of pilgrimage for the Latvian nation, where groups, large and small, from all over Latvia and from abroad, gather to participate in this ongoing cultural event. The next Festival is scheduled for 2018.